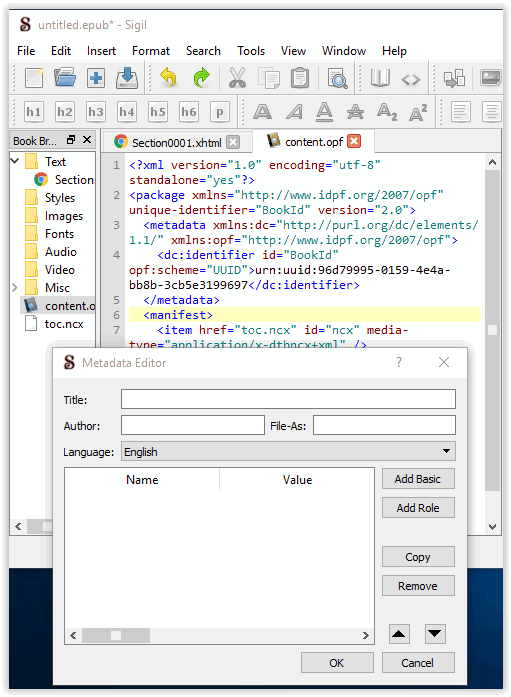 Here are 5 free EPUB metadata editor software for Windows. Using these free software, you can easily edit metadata of various Ebooks if it is missing. In this article, I will talk about 5 such software that can do that in an easy way. 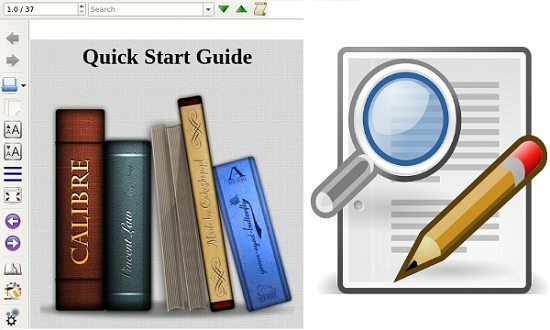 You will be easily able to edit Author, Date of creation, Subject, Series, Format, Type, ISBN, Publisher and many others metadata properties of an Ebook. Some of these software also let you change the cover of your Ebook file and some of them even let you generate a cover for your Ebook. These metadata editor software come with other features as well, apart from just editing the metadata. Using some of these software, you can search for the cover for your Ebook on Google, Amazon, and Open library. And some of these software come with an Ebook converter to convert EPUB file to HTML, PDF, DOC, LIT, etc. You may already know about some Ebook creator or Ebook reader software, but the metadata editing feature is missing from a lot of them. That’s why I have compiled this list of free EPUB metadata editor software for Windows. So, let’s have a look at these software. EPub Metadata Editor is an open source and free software to edit metadata of ebooks. Using this software, you can easily edit general metadata of an EPUB file, including Title, Creator, Series, Series index, Publisher, Type, Subject, Format, and a lot more. Additionally, the software also allows you to edit the cover of the Ebook and you can also edit the NCX and OPF file of an Ebook. And one of the best features of EPub Metadata Editor is that it lets you bulk edit metadata of eBooks. It’s pretty easy to get started with the EPub Metadata Editor. Download its setup file from the above link and then install it. When you launch it, you will see various text fields corresponding to the various metadata parameters. Now, open the EPUB file whose metadata you want to edit using the Open button. After that, use various fields of the software to enter or modify metadata of the Ebook. You can also change the cover photo. And once you have added the metadata, hit the Save button and exit. 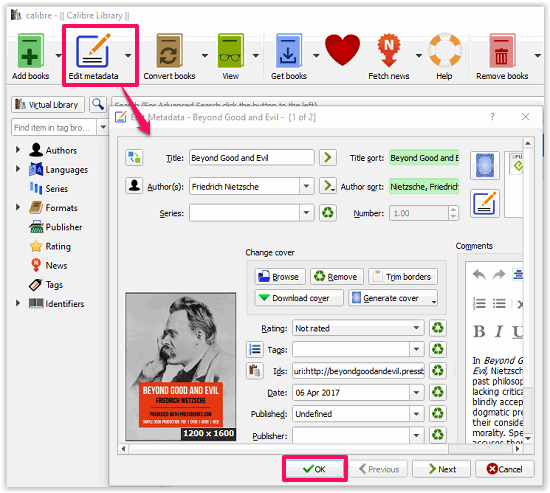 Calibre is actually an Ebook manager software that you can also use to edit metadata of EPUB files very easily. Using the software, you can create or edit various metadata parameters of an EPUB file such as Title, Author, Date, Publisher, Tags, series, and a lot more. Also, it allows you to change the cover photo of the Ebook and also you can generate a cover from the software itself. And one of the best features of this software is that, you can convert an EPUB file to DOC, HTMLZ, ZIP, LRF, LIT, PDF, and many other formats. You can read the detailed review of the software here. Calibre is quite large in size, and it should be as it offers a lot of features. First, download and install Calibre on your PC using the above link and then launch it. Use the Add books button to import an EPUB file whose metadata you want to edit. After that, a window will pop up, where you can edit the metadata of the Ebook that you have just imported. Apart from editing the metadata, you can edit the cover of the Ebook by downloading it from Google, Amazon, and Open library. Also, you can use the Cover generator option that can generate a cover for your Ebook based on the title, and author information. It has several covers designs in it that you can apply to your Ebook cover. Sigil is another free EPUB metadata editor software for Windows. It is actually an Ebook editor software that can also edit the metadata of Ebooks very easily. The software is quite powerful and lets you edit various metadata parameters such as Author, Contributor, Description, Source, ISBN, Identifier, Language, and many others. Apart from this, you can also use Sigil as an Ebook reader and organizer software. Sigil not only lets edit the metadata of an EPUB file, but it also lets you add various other metadata parameters. There is a separate option on its interface that you can use to add other metadata properties. Use the file menu to import an EPUB file and then hit the F8 key to launch the Metadata Editor of Sigil. After that, do whatever you want using the metadata editor. And once you have edited the metadata, save changes and exit the software. 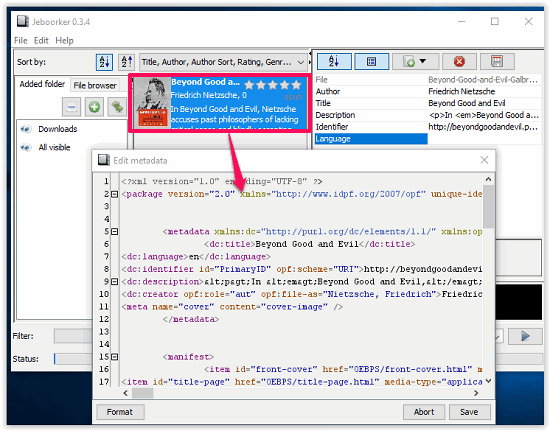 Jorebook is another free EPUB metadata editor software for Windows. The software first scans for the EPUB files in the directory specified by you. After that it lists all the EPUB files that it finds and you can choose any of them to edit its metadata. Using Jorebook, you can easily edit Author, Publisher, Subject, and description like metadata parameters very easily. Editing metadata of EPUB file using Jorebook is pretty easy. Grab its setup file from the above link and then install it on your PC. You will find its interface a quite complicated. Use the Plus sign button to add the folder which contains EPUB files and then it will list all files that it finds in that folder. You can select any EPUB file and edit its various information including metadata. Just right click on ePub file and choose “Edit Metadata XML” option. 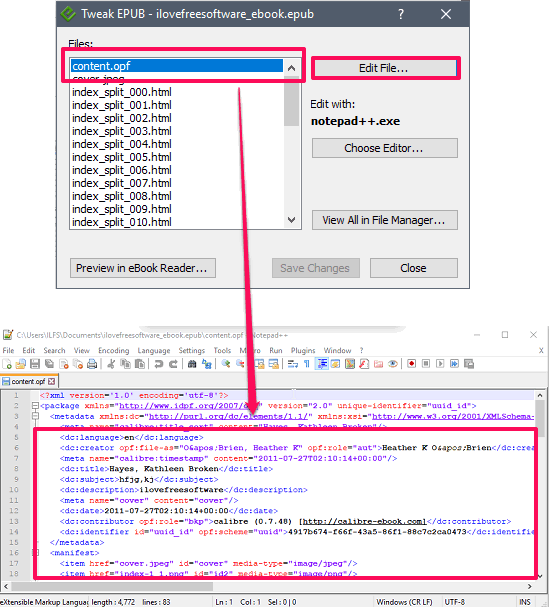 The metadata editor window will open XML file that you will have to edit. After editing the EPUB metadata you can save changes and exit. Tweak EPUB is very tiny and free EPUB metadata editor software for Windows. Using the software, you can easily edit Ebook metadata like Title, Author, Description, Subject, Date, Contributor, and some others. The software doesn’t come with an interactive interface. It actually lets you browse through the Ebook files and lets you open the metadata file in a text editor and edit the file and save changes. It’s pretty easy to edit metadata of Ebooks using this software. Also, it comes as a portable software so you will just have to run it and open your EPUB file in it whose metadata you want to edit. After that it will list all the contents of the EPUB file in the left pane of the software. Locate the file “Content.opf” which generally contains the metadata about the EPUB file. Now, hit the Edit file button and the file will be opened. These are some very good free EPUB metadata editor software for Windows. Using this free software, you can easily edit metadata parameters of an Ebook file, including Author, Title, Cover, Subject, Description, and some others. Also, some of these software let you convert the EPUB file to another format such as HTML and PDF. So, if you are looking for some free software to edit the metadata of Ebook files, then you can use any of the above software.